For the Zoo. Charles Paine. 1921. Estimate $1,000-$1,500. If you're lucky enough to be in midtown Manhattan on November 18, wander over to Swann Galleries on East 25th Street. There you’ll see a steamship docked at a palm-fringed island. 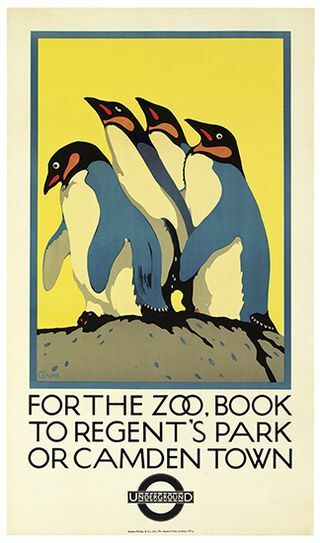 A gaggle of penguins from the London Zoo. A Swiss ski scene. And a train speeding towards the Rockies. What these images have in common is that they are all vintage travel posters. More than 150 of them will be auctioned that day by Nicholas Lowry, president of Swann Galleries, at Swann's auction of "Rare & Important Travel Posters." "Travel posters were undervalued for a long time," says Lowry, whom you might recognize from PBS' "Antiques Roadshow" (he has been known to refer to himself as the program's "resident poster boy"). "They were considered the retarded younger siblings of art posters by artists like Lautrec and Cheret" he adds. "That's because travel posters were put out by train companies with gazillions of dollars and gazillions of train stations. But a Paris department store might have only commissioned 100 or 200 copies of a poster to advertise itself, which would automatically make that image rarer." Palace Hotel, St. Moritz. Emil Cardinaux 1921. Estimate $10,000 – $15,000. It's the rarities that show up at this auction, one of several poster auctions that Swann, a New York-based auction house established in 1941, conducts throughout the year. There are posters like Emil Cardinaux's "Palace Hotel, St Moritz," which is estimated to fetch between $10,000 and $15,000. 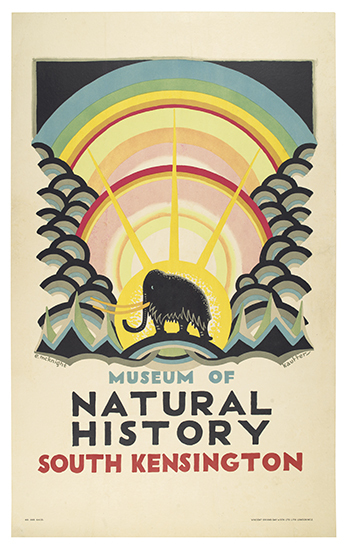 E. McKnight Kauffer's post for the London Underground promoting the Museum of Natural History, estimated at between $3,000 and $4,000. 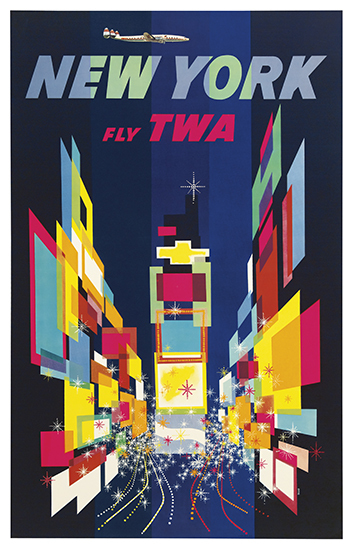 Not to mention David Klein's fantastic "New York Fly TWA" poster, which is estimated to sell for $2,500 to $3,500. From the 1890's to the 1960's, steamship lines, train companies, ski resorts and hotel chains advertised themselves via the medium of posters. They were aimed at inspiring leisure travel and they depicted a world in which everything was beautiful or dramatic and every locale unfailingly friendly. The graphics were bold and clean and so were the destinations. For my money, and that of most other collectors, the 1920's through the 1950's were the heyday. In the competition to catch the public's eye, companies employed well-known graphic artists such as Cassandre, Paul Colin, Ludwig Hohlwein and E. McKnight Kauffer. Museum of Natural History. E. McKnight Kauffer. 1923. Estimate $3,000 – $4,000. But beyond graphic clout, what makes travel posters rare, desirable and collectible is their ephemeral quality. Printed on paper, they were pinned up in train stations, slapped up on kiosks and pasted on the sides of double-decker buses, exposed to weather and serendipity before being plastered over with another poster. That they survived at all is a minor miracle. One thing that makes them appealing is their price. While travel posters range from about $300 to as much as $16,000, we can often grab a favorite image for between $400 and $700 at auction. Now where else can you take that kind of money and buy an original piece of art? "People who buy travel posters buy them for different reasons," says Lowry. "They buy ski posters for their ski chalet and beach posters for their beach houses. They're collected for the destination, the airline and the artist, among other reasons." Lowry clearly knows his posters. As president, principal auctioneer and director of the poster department of Swann Galleries, he sees between 6,000 and 7,000 posters a year. Many are travel posters. Of that number, perhaps 1,200 to 1,400 are considered good enough to be put up at auction. New York, Fly TWA. David Klein. 1956. Estimate $2,500- $3,500. While some collectors are attuned to a specific artist, such as Herbert Matter or Sacha Maurer, many more buy for the subject matter. In fact, one of the great aspects of travel posters is that they dovetail with so many interests. A recent poster in a Swann auction was one that advertised "Stresa-Mottarone," a scenic cable car route in northern Italy. It depicts a cable car ascending a hill with Lake Maggiore in the background and it appeals to lovers of Italy, transportation buffs and devotees of superb 1920's graphic design. Estimated at $1,500 to $2,000, it went for $1,200, proving that "bargains" do exist at auction. Posters advertising transatlantic liners and cruise ships are very popular. So are hotel posters depicting mountain resorts, beach posters for Hawaii and the Rivera, and food or wine posters from a specific country. 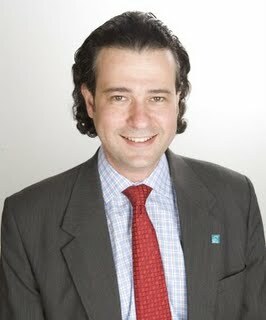 Nicholas Lowry of Swann Galleries. "As a rule," Lowry says, "Landscapes sell for less than action scenes or scenes with people. Ski, golf and tennis posters are popular. But vehicles, such as trains, airplanes and cars, transcend all." Lowry says that he's seen American posters come of age just in the last ten years. 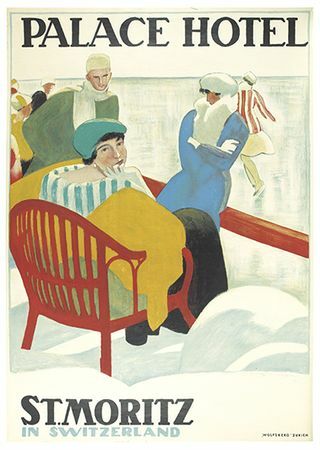 Traditionally considered a European art form, posters advertising American Airlines flights to Chicago, New Haven trains to New England ski mountains and America's national parks are newly appreciated. As for masters, Lowry points to Leslie Ragan, "who did the best iconic American travel poster, which was for the 20th Century Limited train." Not surprisingly, he advocates the idea of buying posters at auction, as opposed to buying them directly from dealers. "Ideally," Lowry says, "an auction can offer you a wider selection of material. A dealer is bound by what he can afford. The larger the auction house, the bigger the reputation they have, the more material they get to sell. At auction, in almost in all cases, you get a cheaper price and the selection is better." There are downsides to auctions, however. What comes up for auction is obviously a matter of serendipity. And there's no guarantee that a poster estimated at $700 to $900 won't go for $1,500 as two enthusiastic collectors bid against each other. That's why many collectors supplement auction purchases with visits to poster dealers or spend hours on eBay. Take Geoffrey Weill, who once bought mostly from dealers but now heads to eBay. The president of a Geoffrey Weill Associates, a public relations agency, Weill says he's "always been bonkers about travel posters." He started collecting back in 1974, when he bought a poster for the 1940 Winter Olympic Games in Helsinki, which were never held because of the war. He now has about 60 posters. "My collection really took off because of a love affair with Israel and Palestine," Weill says. "One of my best Palestine posters was created in 1936 by the Jewish agency to promote tourism to Palestine." Weill, who says he's never spent more than $600 for a travel poster, has a rotating exhibit of his collection on his company's website. Condition is important when buying posters. Most dealers have a grading system that accounts for tears and holes and repairs. Most posters are backed on linen, which makes them less likely to incur further damage. Linen-backed posters are also ready to frame. "A poster was designed to capture your eye and engage your attention on a street filled with posters trying to do same thing," Lowry says. "So the way I judge a good poster is 'Does it make you smile?' You don't have to explain that smile. As long as it affects you, the poster has done its job." You can view the entire catalog of "Rare & Important Travel Posters" online at SWANN GALLERIES. Are the David Klein NYC posters still available? it is a little late, but do you still have the posters? Sorry, I don’t. I’d take a few photos of it and send it along with a description to Swann for an estimate.